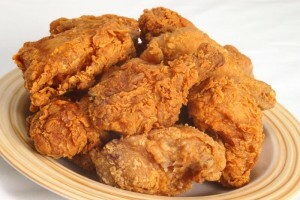 Nothing is better than the savory crunch of fresh fried chicken and former YUM! R&D Chef Jake cooks a delicious batch of chicken. Chef Jake’s yummy country-style chicken seasoning adds the perfect flavor to this fried chicken dish. The longer you let the seasoned chicken pieces rest prior to frying, the crispier the crust will be. Use peanut oil for best flavor and be sure to tap the chicken after breading to release extra flour and keep your oil cleaner. Whether served hot for a weekend dinner or cold for a picnic lunch, fried chicken in a true southern delight. Place the sage, onion powder, garlic power, white peppercorns, black peppercorns and kosher salt in a spice grinder. Grind all the ingredients to a fine powder. Place in a bowl, add two cups of flour and whisk until mixed well together. Heat the oven to 180 degrees. Fill a large, deep ( 5″ or more) heavy bottom pan or cast-iron dutch oven with 2″ of peanut oil; attach an oil thermometer to the pan. Heat the peanut oil to 350 degrees using the oil thermometer to gauge the temperature. Combine the egg whites and whole milk in a bowl and whisk until well-incorporated; pour in a shallow bowl. Place the flour mixture in a shallow bowl. Set up 2 wire cooling racks over half sheet pans. Dip the chicken in the chicken seasoning; pat to remove excess. Dip the chicken in the egg white mixture allowing the excess to drip off. Then re-flour again by dipping back in the chicken seasoning and patting again to remove excess. Place the breaded chicken pieces on one of the wire racks to rest 10 minutes. When the oil has reached 350 degrees, add only half the chicken pieces to the hot oil; increase the heat to allow the oil to recover to 350 degrees. Fry the wings for 10 minutes, remove to the other wire rack set over a sheet pan to catch any oil. Turn the breasts, legs and thighs over after 10 minutes and continue to fry for 6 minutes longer or until the internal temperature reaches 165 degrees. Put the wire rack in the oven to keep the cooked chicken warm. Fry the remaining pieces of chicken when the oil has again reached 350 degrees. Chocolate Stout Cake Truffles with Irish Whiskey Sauce.